Dishes to accompany sad memories: Bake the way Nana did. Does memory have a taste? Anyone who’s tried to make their favourite family dishes without a recipe will tell you it does – as distinctive as smell, touch and feel. That’s why when you eat food “like grandma used to make”, it instantly transports you back to another time and place. Irris Makler: "Somehow those tastes from childhood seem the best." Across all cultures the familiar taste of home sings out to us, bringing with it family memories, a sense of belonging and most importantly love. I’m a journalist, and a Middle East correspondent, a lot of my time is spent on the frontline covering wars, but I’ve begun working on a new project collecting the life stories and the recipes of Jewish women who were alive during World War Two. I’ve filmed three wonderful women, now in their 80’s and 90’s, in their kitchens with their grandchildren for the ABC’s Compass programme. They share recipes for the food they grew up with in Europe, and stories of surviving genocide and arriving here as refugees, teaching their grandchildren to love the tastes of the past. Eva Grinston, Lena Goldstein and Rita Ross are remarkable women, who have seen evil – maybe even the heart of darkness – when they were growing up in the Nazi era during World War Two. Lena Goldstein&apos;s Jewish I.D. during WWll. Their stories are spell-binding, at times horrifying and also inspiring. All three are fabulous cooks, and all chose to bake cakes for our cameras, sweet dishes to accompany sad stories. When a matriarch’s experience is so bitter does she pass on fear and trauma, or a stubborn survival instinct along with her cooking secrets? Both generations speak frankly about their unbreakable bond. I’ve been searching for that taste of memory ever since my own beloved grandmother Lea died more than 20 years ago, without me having written down any of her recipes. That’s something I’ve never forgiven myself for, because when I was growing up in Sydney, it was her kitchen that was the centre of my family life. Lena Goldstein and her grandson, Ben. It was where we sat after school, where the family met, where she cooked – which she did every day – without really consulting recipes. She was an instinctive cook, so it was all done on taste and feel. If you wanted a recipe, you had to watch and write down the quantities yourself. When I finished studying I went to try my luck in London. Grandma Lea was already unwell when I left, and she passed away not long after I arrived there. Then my aunt, her daughter, died suddenly – and it seemed no one had collected my grandmother Lea’s recipes. When I returned to Sydney, I found myself obsessively trying to bake my favourite of her cakes, her honey cake. Dark Honey Cake – simple and delicious! 1 tablespoon of mixed spices. Grind up any mix you like. My favourite for this cake is fresh nutmeg, cinnamon, and cloves. A pinch of pepper is also good! Cloves have a v strong taste – so no more than 1/2 teaspoon necessary in your mix. Make one large cup hot very strong tea, with the boiling water and teabags. Set aside to steep. Sift in flours, bicarb and spices and mix well. At the end, pour in the cup of tea. I melt the Nescafe in a tablespoon of hot water and add it here too. Mix NB: Mixture will be runny! Bake in a large circular cake tin, minimum 20 cm, or 2 loaf tins. You can also make muffins, or all 3 at once. This often produces more cake mix than I am expecting! If the circular cake tin has a removable base make sure it sits tightly, or it may leak. Bake at 180 degrees. for 1 hour [sometimes a little more] Makes a delicious moist cake which keeps well, and improves with age. I baked and discarded one honey cake after another – a light version from Elizabeth David, with clover honey and almonds, a heavier Russian cake, made with three types of flour and cottage cheese. They were all delicious, but they weren’t right. They weren’t my grandmother’s honey cake, so I’d start the search again. Rita Ross and her grandson, Jake. We all have a dish that’s on the table at family gatherings and that says family to us. For me it was that honey cake. Finding it again has become a symbol of my grandmother’s love, and a way to be close to her even after her death. In a way, that why I’m doing this project. I don’t want anyone else to have to search for their grandmother’s recipes. I also want to hear the extraordinary stories of the last Australian Jewish Holocaust survivors. Eva Grinston is a warm gracious Sydney grandmother. As a teenager she was deported to the concentration camp ofAuschwitz, where her mother, sister and aunt were killed. After the war, Eva returned home. The house had been looted. Soldiers were billeted there. All that remained of her family was a box her mother had hidden in the basement. In it Eva found her grandmother’s cookbook. She’s been cooking from it ever since, teaching her grandmother’s Czech recipes to her Australian grandchildren. Eva Grinston with her grandchildren. The cake she cooks for our cameras is a flourless chocolate, sour cherry and walnut cake from her grandmother’s book. It’s been on the table at every family birthday. Eva struggles with how much of her traumatic story to share with her grandchildren. 18 year old Emily Rice is her only grand-daughter, and says she finds it difficult to think of her grandmother suffering so much. Eva Grinston gives talks in Australian schools, about the importance of extending a hand to new immigrants, and recognising the humanity of other people, even those who look and sound different from you. 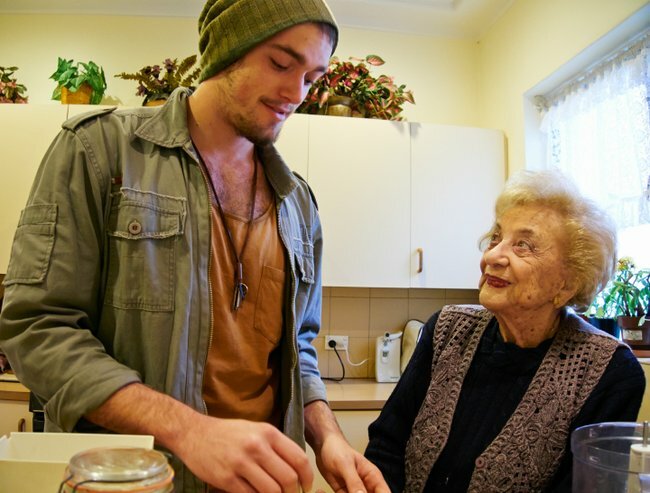 Send your grandmothers’ recipes, or other family favourites, to the ABC Compass recipe page.